[prMac.com] Barcelona, Spain - iClassics Productions is very pleased to make the Interactive Adventures of Sherlock Holmes free for a limited time. This is to celebrate their two-year anniversary, in which short time they have staggeringly managed to produce nine incredible, immersive and interactive apps from a range of authors. One of such authors happens to be Sir Arthur Conan Doyle, and The Interactive Adventures of Sherlock Holmes contains the entire and original text of the famous "A Scandal in Bohemia." This is a fully-updated app, which now features The Sherlock Holmes Stickers, adapted for the iOS 10. In contrast to many other iClassics, which contain three or four short stories from the author, this app features one longer story, separated into three chapters. This means that it can be considered as a feature-length app, providing almost an hour of "immersive reading" entertainment. Moreover, the text is available in four languages, which can be changed at any moment of the story: English, French, Spanish and Portuguese. The text of this classic tale is enriched with artistic illustrations, animations, interactive elements, and original sound effects and music. All of this combined constitutes a new reading concept that iClassics Productions has been working towards: Literature 3.0 (Immersive Reading). Sir Arthur Conan Doyle managed to create the most famous detective in fictional history, whose legendary status arguably transcends the fame of the writer himself. Set in grey and grimy London, and filled with fog and mystery, A Scandal in Bohemia is read like never before. Brought to life with imagery, movement, sound and interactivity, readers are plunged into the mind of one of the sharpest detectives ever invented as he discerns nuances most people overlook. Feel your way through the fog of old London, and walk alongside the most memorable creation in detective literature's history. A Scandal in Bohemia is the perfect story to be adapted for the Literature 3.0 format, allowing for total immersion and extensive interaction. Illustrated to an incredibly high and artistic standard by Jordi Solano, directed by David G. Fores, and brought to life by the animation team, this is an extremely high quality, sophisticated and artistic app. 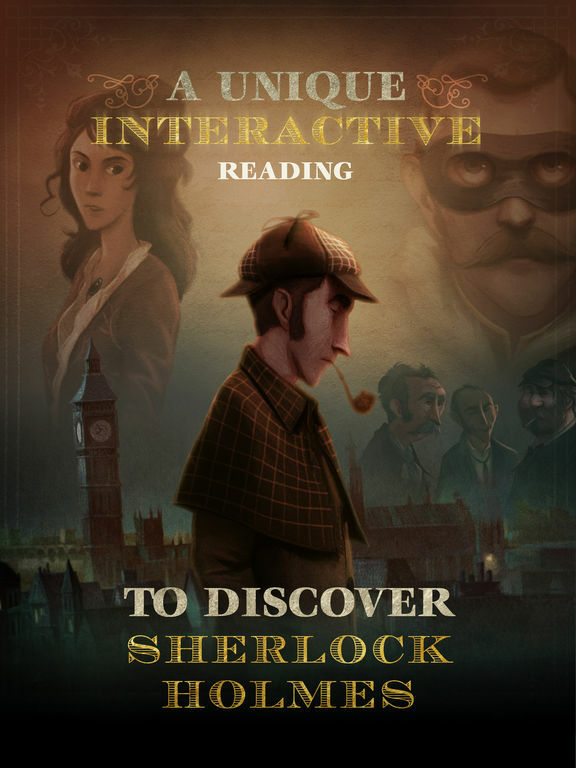 The Interactive Adventures of Sherlock Holmes should be stolen while it's free! Just watch out for Sherlock! "You'll see what Sherlock and Watson both see - the details, their plans, even the mannerisms described in the book - and without much (if any) artistic embellishment whatsoever!! The makers of this specific app need to produce many, many more of Doyle's famed stories, post haste!" "The cleverest app I've encountered! I don't know how I found this, but I'm happy I did. Really clever and an enjoyable experience. I'll be buying more of the series." "As an 8th grade teacher, I use Sherlock Holmes stories in my lessons, and this has made a very large impact in how my students comprehend and interact with the literature. I am forever indebted to the efforts that the iClassics team has put forth to make literature truly come alive." iDoyle: The Interactive Adventures of Sherlock Holmes 1.1, fully-updated and complete with the new Sherlock Holmes Stickers, is now free worldwide for a limited time only. It can be downloaded from the App Store in the Books category. iClassics Productions, S.L was founded in 2015 by the experienced management team of Play Creatividad. iClassics Productions, S.L is formed by creative and talented individuals, who apply their skills and drive to create immersive reading apps using the masterpieces of universal and classic literature. The iClassics Collection brings literature to life, made relevant for tech-savvy generations through the use of cutting edge technologies. We've reinvented reading by transforming it into a unique immersive experience where the user feels immersed in the story. iClassics Productions does not merely make book apps, but has rather become a reference point in the emergent interactive literature. All Material and Software (C) 2016 iClassics Productions, S.L / All Rights Reserved. Apple, the Apple logo, iPhone, iPod and iPad are registered trademarks of Apple Inc. in the U.S. and/or other countries. Other trademarks and registered trademarks may be the property of their respective owners.